YOU HAVE IDEAS. WE HAVE ANSWERS. Put Eatery Pulse to work for you. BUSINESS Executive Editor Rick Zambrano contactrick@eaterypulse.net Assistant Editor Roshan Thomas Editorial Designer Ashley McCarty Contributors Eric Nomis, Roshan Thomas, and Roberta Matuson Restaurant C-Suite Magazine is part of the Eatery Pulse Network and distributed by Eatery Pulse Media, a fastgrowing information services, consulting and creative, custom-media solutions firm based in the Washington, D.C. market. Our flagship, digital magazine was specifically created for multi-unit restaurant executives. It will deliver the most highly-meaningful news for the industry’s top leaders of today, and the visionaries of tomorrow. Today’s C-suite executives and their managers need information that is carefully selected, meaningful and delivered in a seamless, cohesive fashion. Stay updated with all our content at: subscribe.eaterypulse.net Copyright 2019 Eatery Pulse Media. 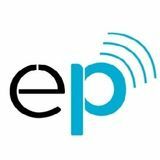 To place an ad, email sales@eaterypulse.net or call 301.304.7732. Reach out to us at success@eaterypulse.net to learn about all our marketing programs, including advertising, video production, video marketing, and custom media solutions. 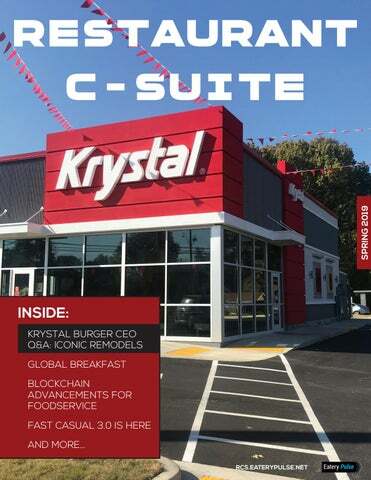 Powered by On the cover: Iconic Krystal brand gets a remodel. Photo by Krystal. Photo Left: Chiko Dupont Circle location, Washington, D.C. Photo by Eatery Pulse Media. Spring is finally here, holding new opportunities for chain restaurants. Photo by Florin Alin Beudean. to more markets and all 50 states, while Grubhub focused on technology-based acquisitions and incremental revenue to create the “perfect storm.” With the 2019 National Restaurant Association Show approaching, it’s a time to share new ideas and collaborate further. Why are we always the disrupted? It’s time to be disruptors, ourselves. To innovate. It hasn’t been business as usual for a while, now. The restaurant industry has an opportunity to be more than just proactive. particularly as technology advances so quickly and some of the technology is not necessarily our friend. In online searches, chain restaurant locations are constantly fighting off “clone” web listings by other technology companies and competing against virtual restaurants that exist only in online marketplaces and apps. BEFORE WE TOLD YOUR STORY, WE WROTE OURS. Is it time for a comprehensive, strategic foodservice partner? More restaurants are looking to nearly eliminate waste. Photo by Tom Crew. Waste can be a byproduct of cooking, certainly, but there are many more sources of added waste. Lack of preparation or good production planning can lead to greater waste due to food spoilage. Restaurant managers have typically been fond of visual inspections of produce and other perishable product to detect any lack of freshness. Not handling food properly can lead to food “kills.” Especially In the fine-dining and casual-dining segments, lack of accuracy in taking an order or poor cooking execution can lead to dishes that end up being returned to the kitchen— some cannot be salvaged. Among the many other sources of waste, spoilage can arise due to poor inventory management and during foodservice distribution. Kitchen and inventory management are a focus of restaurant waste. Photo by Rohan G.
long. These types of breakdowns can reduce the shelf-life of produce by up to one week even before the restaurants receive it, he says. can help detect sources of food contamination more rapidly, making it easier to conduct appropriate recalls. Technology is helping track and monitor perishables from grower to distributor, and on to the restaurant. It is up to restaurant chains to ask suppliers and distributors to implement such technology. IoT sensors, in fact, can go a long way toward this goal, monitoring cooling, freshness and the time it takes for produce to go from field to fork. Zest Fresh is an example of a technology solution that’s being deployed to help monitor and ensure freshness going back to the source. “Digitize your inventory management procedures,” says Cox. “The most effective way to minimize mistakes is to integrate your inventory management solution with each supplier electronically. Also, you can save a lot of time (and keep costs low) in placing orders and (conducting) invoice reconciliation.” Mistakes can happen easily in a busy chain restaurant, and that can result in waste or lost inventory. Employees should clearly label food product that is prepared in house, using “made on” and “use by” dates in accordance with restaurant policy. At the corporate or support center level, cross-functional teams can add a lot of value to zero-waste initiatives by working with suppliers and management to develop policies to reduce waste. Marketing teams can use whatever initiatives are in place to successfully engage customers who care about these issues. Restaurant chains will benefit from creating a top-down and hands-on approach to reducing food waste, even creating incentives for employees to produce new ideas and suggestions. Reducing the food and packaging that doesn’t get used by the restaurant or consumed by the customer is a team effort, but one that will reap long-term dividends. Iconic Series prototype design. Photo by Krystal. business results. We deploy a comprehensive digital strategy that incorporates paid social and partnerships with third-party vendors to track every single digital tactic deployed and the resulting real-time walk-in business. We’re very focused on managing acquisition costs. That being said, it all starts with a great creative. Our “Live A Little” mantra informs all marketing campaigns and touch points. RCS: How have the remodels addressed speed of service at the Krystal stores that were revamped? PM: The new stores are built for speed. They’re smaller, faster—and square—like our iconic burgers. We’ve seen an across-the-board 10 percent improvement in processing time for drive-through orders, shaving off 20-30 seconds for customers. The kitchen layout has been reconfigured to create larger work zones as well as expanded windows to accommodate drivethrough traffic. The redesigned restaurants have two menu boards that funnel into a single lane and three POS devices, one for each menu board and one for processing payment at the window. RCS: Tell us how you engage franchisees for remodel projects at a time when other QSRs have garnered skepticism? PM: Our initial redesigns are company stores. Our strategy was to provide proof-of-concept for key franchisees, who are now signing up for owner-financed scrape and rebuilds, with some incentives. Shrimp and Grits. Photo by Chiko. “Chef-inspired concept” is a phrase that many inside the restaurant industry may want to vanquish in 2019. How about chef-driven or chef-managed? That appears to have more purpose and significance. On that point, enter Chiko (Chai-Koh), a three-unit chain, born and bred in Washington, D.C, and expanding nationally (but quietly). Chiko is not just a restaurant, it’s also a trend at the same time. And it’s growing into a chain, with three locations now open (two in D.C. and another in Encinitas, Calif.). Chiko combines Chinese and Korean dishes and flavors, calling itself a Modern Chinese-Korean restaurant. cuisine will need to be authentic and not overly adventurous, possibly scaring away customers. Chefs help ground the cuisine and keep the restaurants cozy and approachable. Gerald Addison and Chris Morgan (Compass Rose and Maydan, Washington, D.C.) headlined a Chiko After Dark event. Photo by Chiko. of Metropolitan Washington (RAMW) and Events DC, the sports and entertainment authority for the city, host the RAMMYS and pay tribute to the culinary and entrepreneurial professionals in the local industry. Chiko received a RAMMYS Best New Restaurant Award last year in D.C.“I’m dedicating this to all the women in my life,” said Scott Drewno, one of the three partners that are part of this growing enterprise during his acceptance speech. The RAMMYS are D.C.’s restaurant excellence awards and a great honor, since the city is now an established culinary and foodie destination. Sister media outlet, Swizzle Chill TV, had the opportunity to interview Chiko, as well as other winners, at the RAMMYS 2019. “It’s casual, fun and funky,” said Drewno of the then-one-year chef-driven concept. “We wanted to form a fun, kind of familyoriented company (Chiko’s parent, Fried Rice Collective). We decided to make the first step into it—the three of us—with Chiko.” Chiko was also a semi-finalist for the Best Restaurant Award in 2018 from the James Beard Foundation. and a top forensic trendologist in the country, maintains that consumers are not feeling particularly grounded or confident. This is why Chiko’s emergence is so timely, and its popularity and rise will be determined by a “perfect storm.” The concept strikes a delicate balance between food that is tasty, served quickly, feels comforting, and is priced reasonably. It’s challenging to deliver such a product in a diverse and eclectic city like D.C., but Chiko does it well. In culinary and industry circles, fusion was a bad word for a few years. Some chefs went too far with combinations that did not provide the authenticity that global cuisine deserves. With Chiko, the partners are balancing adventuresome Korean flavors, with the comforting, familiar dishes and textures of Chinese food. Chiko’s founders have found a formula that is years in the making and is a gateway to sophisticated dining markets. The timing appears right to take Chiko to the next level. “Chiko After Dark.” It’s a fun evening, with access to food from guest chefs and cameos by the culinary visionaries of the city. Recent events have included local chefs,including Gerald Addison, Chris Morgan (Maydan and Compass Rose), Boston’s Jamie Bissonnette, and Adam Greenberg and Brandon Langley from the Coconut Club. In February, the restaurant paid a tribute to Mardi Gras with its own Nawlins’-themed celebration, featuring David Guas of Bayou Bakery and the everpopular Gina Chersevani of Buffalo & Bergen. Chiko’s Orange Chicken. Photo by Chiko. some nice shitake mushrooms on the plate, who cares? Not likely that even the most restrained customers would be able to stop at just one Pork and Kimchi Potsticker. These are the types of dishes that can be had in quick fashion, and deliciously. Employees don’t work for companies. They work for people. The most successful leaders I know, are what I call magnetic leaders. These are leaders who appear to effortlessly attract talent that sticks around. In my book, “The Magnetic Leader,” I write about the seven traits commonly found among magnetic leaders. In the interest of time and space, here are three of these traits. Authenticity. Magnetic leaders don’t try to be someone else, nor do they change who they are based on office politics. They are true to themselves and are honest in their dealings with others. They are not afraid to share their mistakes or shortcomings. Their authenticity is refreshing. Selflessness. Leadership is a service business, and service comes with sacrifice. Magnetic leaders serve their people first, before serving themselves. Strong communication. Magnetic leaders communicate frequently and clearly. They speak their minds, even if it makes them unpopular. When they are forthright with their opinions, such people often become even more magnetic. This is because people always know where they stand when in conversation with these kinds of leaders. Some of you may be thinking, “Who has time for this? This is the restaurant industry where we’re burning the candle 24/7!” My response is, you can’t afford not to pay attention to your leadership style. Here’s why: There are record levels of low unemployment in the U.S. The current rate is 3.9 percent and is even lower in some cities and towns. We are at full employment, which means there are fewer people to be had. Leaders must do everything in their power to keep their talent. Studies consistently show that people leave their leaders, not their companies. Here are some ways to ensure you and members of your leadership team are irresistible in every way. • Be visible. Say no to meetings and instead, spend this time interacting one-onone with your people. • Set a good example. Treat people the way you’d like to be treated and make sure others do the same. • Don’t ask people to do anything you aren’t willing to do yourself. If team members need to work crazy hours to get through a restaurant opening, work alongside them, and help out where needed. • Get to know team members on a personal level. Has one of your direct reports recently decided to further their education? Pictures for “Trends that are buzzing in 2019”: Trends cover page photo by Mariana Montes de Oca. Top trend egg power photo by Mind Body Stock. CBD and Cannabis photo by Matthew Brodeur. Interest in the Sea photo by Cayla. Plant-based nutrition photo by Hermes Rivera. Egg redefined in context of culinary and nutritional power After years of being maligned and tied to health risks, the egg is back as a focus of attention in menu development, culinary and packaged-goods circles. Consumers are drawn to the protein power of egg. As a source of inspiration, the egg is piquing the interest of chefs for its versatility and how well it ﬁts into bowl-centric dishes. In retail, eggs are the star ingredient of snacks, like in the popular Bantam Bagel Egg Bites. Fish snacking, fish protein, eye on sea plants There’s renewed interest in seafood, including ﬁsh, and botanicals, positioning them as exciting and powerful sources of nutrition. Seaweed has introduced a host of other sea plants in the cpg category and on the menu, while ﬁsh is being repositioned as a protein source. Fish-skin snacks are also having their moment. Seafood mentions have slipped on the menu by four percent (Datassential, NRN), but consumers are looking for a variety of non-meat sources that will fuel them for the next generation. They are also looking to enjoy sustainable ﬁsh options at restaurants. PLANT-BASED NUTRITION Plant-based proteins, nutrition sources riding high Plant-based sources of nutrition are riding high, particularly plant-based meat alternatives. Beyond and Impossible Foods are two companies that are generating a lot of interest as they release their latest iterations of plant-based patties that emulate the real thing. Flexitarianism is on the rise and consumers are looking beyond animal-based proteins for their next meal. Vegan cheeses are getting some attention and a new generation of chefs are interested in the plant-based sourcing of more dishes for their menus. • 14 percent of consumers regularly use plant-based alternatives (NPD) • According to Packaged Facts, 37 percent of consumers ages 25 to 39 are likely to seek out plant proteins, the highest of any age group, followed by 22 percent of adults under age 25. Customized Indian Lite Bowl with Tandoori Chicken. Photo by Bamboo Asia. consuming daily breakfasts of oat porridge or frosted corn flakes.” Badaracco notes that these studies have helped drive interest in breakfast, particularly as they trickle throughout various newscasts and published media and journals. At the same time, consumers are enjoying a greater number of breakfast occasions away from home. This is part of the economic recovery. Badaracco says, “Breakfast traffic research is also an indicator of economic conditions. The playground is shifting as traditional breakfast fair is joined by global dishes, which are newer to Americans.” Moreover, the strength of the economy will also spur interest in breakfast, meaning that as more consumers are working (or working longer hours), breakfast will continue to transition from the home to foodservice. Philippines and the Korean Peninsula. “I think something we don’t see too much of in America is breakfast rice bowls like bibimbap with eggs.” Hopfinger also points to spamsilog, a Filipino dish of fried garlic rice with eggs and Spam, as an opportunity to introduce new palettes to this type of cuisine. He expects that interest in these types of dishes, which satisfy a craving for comforting breakfast foods, will continue to grow. Khao tom, a rice soup, and its thicker, more porridge-like variation, johk, are on Badaracco’s radar. Given the need for portability and convenience in the QSR segment, certain dishes and adaptations will be more appropriate for the fine-dining scene, polished fast-casual concepts or the casual dining segment. However, there are ingredients and flavor profiles that can be adopted more universally. This is to say, all popular global foods have a profile that can inspire more adventurous and worldly breakfast dishes. “Gen Z consumers are more on the forefront of trends and may be thinking more of those adventurous foods than the standard staples,” said Jenny Zegler, associate director of Mintel Food & Drink to Food Business News last year. Being on the front lines of the trend will result in a big win with Gen Z and Millennials. help of the Ron Shaich, founder of another future-forward chain, Panera Bread. With the rise of chains like Cava, it’s clearly evident that interest in Mediterranean cuisine will grow. Demand for Mediterranean cuisine can only strengthen as more consumers are exposed to such foods in quick, convenient formats. Indian Rangila bowl. Photo by Bamboo Asia. use the breakfast bowl format and offer an exciting taste profile that takes breakfast to a new level. Badaracco offers up additional inspiration with countries whose foods can form the basis of emerging breakfast dishes: • Lebanon—manakish, a flatbread “pizza” seasoned with the Mediterranean spice blend za’atar. • Britain— a heaping plate of bacon, Lincolnshire sausage, black pudding, eggs, baked beans, tomato, mushrooms and toast, known as the “full English breakfast.” • Israel—smoked white fish, lox, bagels, shakshuka, hummus, halloumi, labneh, rugelach, bourekas and gvina levana. • Cuba—casamiento (rice and eggs), huevos habaneros (ham and eggs), picadillo cuacua (Havana ham and eggs), torrejas con frutas (Cuban French toast) and the tostada (Cuban toast). 2018 ProStart winners with Ted Allen, Food Network celebrity. Photo by NRAEF. Kith and Kin; Andrew Dana, CEO, Timber Pizza; Ayesha Abuelhiga, CEO, Mason Dixie Biscuit Co.; and Chef Jerome Grant, Executive Chef at the National Museum of African American History and Sous Chef at the National Museum of the American Indian will be our featured Share-aCoke panelists. These exclusive opportunities provide students insights into what it takes to launch a successful career, run a restaurant or start your own business. ProStart develops high school students, focusing on culinary and management skills to prepare them for future restaurant industry careers. Photo by NRAEF. The rise of c-store foodservice business has caused restaurant executives to rethink their strategy as they approach 2020. Convenience is king, and an increasing number of restaurant chains will devote more resources to making the customer experience easy and convenient. Innovating for speed Grab & go is prized by consumers in this day and age. Foods that are pre-prepared and can be literally snatched up, paid for, and taken out are the most sought-after items at c-stores. The data points to grab & go beverages, bakery items, hotdogs, and prepackaged sandwiches and salads as the those that purchasers look for most at c-stores. Wawa built an empire on hoagies and breakfast sandwiches. Quick, convenient foodservice offerings have formed a strong foundation for some of the top c-store chains, and helped Wawa get to $10B in revenue as a private company, according to Inc. Additionally, c-stores are jumping in on the healthy foods trend that has been sweeping the nation for the last few years. The AlixPartners report states that, between 2017 and 2018, there was a 10 percent increase in the number of respondents who said healthy food choices were “extremely important” for them at c-stores. To avoid loss of customer base, fast-casual restaurants, especially, need to follow c-stores and offer healthy grab & go options that are healthy. and up the convenience factor. (ordering, payment, etc.) at c-stores, showing that there is still a long way to go before Starbucks-type rewards systems become standard in the industry. HOW'S YOUR FOOD COST? WE CAN HELP.